Well, some happy character, old Kahn! And some introduction to this case. As I drove to the Stevenson Museum, a headache started to punch my skull and it hasn't gotten any better since. At least you're here, cause I don't feel like doin' an awful lot today. I've been here before, see. Got a past here, if you know what I mean. Doesn't make me doin' twirls around here, anyway. But then again, haven't I brought you along to do all the work for me, compadre? Ha, serves your right to leave now. Or do you have the nerve to stay and investigate? No worries, mate, I'm here as your guide, your mentor and ultimate rescue line. Now, don't stand there! Act! After the tour in the Stevenson Museum started, you meet Mei. She'll tell you about the mysterious things around that place. The meaning of this demo is to find 4 puzzle pieces which will give you entrance to the Capricorn Room. The puzzle pieces are hidden in the paintings. You can get to them by clicking on the painting and then grab the piece. One of the empty puzzle slots beneath the video screen will be filled up with a shade of red. 1. Painting of a women putting flowers in a vase, near the front door. 2. Painting of a writing man, left of painting number 1. 3. Painting of 2 half naked women, left of the fireplace. 4. Painting of men dressed in black in Rembrandt style, on the wall opposite to paintings 1 and 2. As soon as you've found all 4 pieces, the puzzle screen will appear. Switch all pieces (or at least 3 of them) by clicking on them with the right mouse button. Then put the puzzle together by dragging, turning and dropping the pieces; it's a fuzzy picture of the Great Hall with a glowing crystal ball in the middle. Click on 'continue'. Now go to the crystal ball in the middle of the Great Hall and click on it. Watch the movie clip of a wall panel sliding away. Go to the fireplace and click on the circle in the middle. It slides away and you can get the key. Click again on the key and Mei appears. Listen to her story and follow her through the door. Keep walking till you hear somebody scream. A woman (her name's Susanna) leaves a room with a red door; the Capricorn Room. Enter and the Tour is over. Okay. You start in the Great Hall. Yep, it's a hall and it's kinda big, so Great Hall is fine. Did you get a map, yet? Got one already? Ah, never mind that booklet. Get one from the wall behind you, 90( to your left from the starting position. Take a look at the guestbook beneath it right away. Walk to the middle of the room and examine the crystal ball. Also go to the fireplace and get the poke. During your stay in this hall, you might run into Laurie. Don't get distracted by her attitude, it'll explain itself later. Do follow her outside. Yes, open the door. Ha, scared you didn't I? Don't worry, it's Mei, a concubine. I'll tell you more about here later. Now leave the hall through the red door at the right of the end of the hall. Inside, walk to your left. You can see a lot of ancient Mongol stuff displayed. If you're interested, take a look. Most important is the black pedestal with the golden plate telling you this is the concubine's chalice. What chalice? It's missing! Walk to the far end of the room and watch the goathead. Rub over the jade on the forehead and see Mei again, asking again to free her. Believe, you should but you can't right now. So forget about her for a minute. You can also play with the catapult in the middle of the room. It's a pretty easy to use instrument. Put a rock from the bucket into the pouch. With the levers you can aim and shoot. You can hit quite a few objects in the room. Also walk to the sarcophagi in the middle of the room. Open the lid. Yeah, he's dead. That's not so hard to see, my friend! Better examine his hand, he holds a watch. Examine it carefully and find out it's an old silver one with an inscription; "To M.A.S., the Genghis Kahn of Wall Street. From your minions at Fealty Investments". In the Gift Shop, you can't miss Lorena Carnicero. Perfect collision of beauty and brains. She reacts on the sound of something breaking and that, my friend, leaves us time to investigate. First, look at the counter, there's a brochure, but we've got that one already. Lost it? Get another! Darn! If you start losing things already, things will get rough... Hum, well, check the newspaper too. Yeah, the one on the counter. Read the article on the Museum and Stevenson. Read it? Now get to the display shelves. There's some puzzles which might contain valuable info. Try them now. There's four of them; all different amount of pieces and color. In my humble opinion, you should swap the pieces before solving the puzzles. The backside of each puzzle has the text piece, which makes it easier to solve it. Pieces can be swapped and turned. When two pieces match, they'll click. Some practice will make you solve them. 1. Puzzle Green 250/ Capricorn Head vs. Museum Painting. "The Capricorn head is the centerpiece of the Stevenson Museum's collection of treasures from the tomb of Genghis Kahn". 2. Puzzle Orange 300/ Crystal Ball vs. Statue. "This ball with it's unique golden stand depicting carved goatheads is said to be a focusing crystal for ancient Mongol magic". 3. Puzzle Blue 440/ Ceremonial Knives vs. Itself. "These ceremonial knives were used in religious rites during the reign of Genghis Kahn". 4. Puzzle Brown 550/ Mongol Sword vs. Scorpions. "This Mongol sword is believed to have been used in Genghis Kahn's burial ceremony. Blood sacrifice was not a part of the ritual, yet the dark stains may in fact be human". Those mindcrackers made you hungry? Let's head for the Snack Room, you'll find it on the map. Meet old Franklin Macy. Not the talking kind of guy, hey? Don't let it bother you. When he has left, go to the sink. Get some plastic eating equipment from the baskets; knife, fork and spoon. Get a plastic cup, too. Oh, don't forget the sugar cubes. Get the ice from the freezer, too. Walk towards the table that's to your left when you've entered the room. On this table lies the Mongol sword you already know from the demo and the Gift Shop puzzle. Below it are some blood samples. Use the plastic knife to get a blood sample from the sword yourself. Might be difficult, but when you carefully place the knife over the bloody stains on the sword, you should get a blood sample sooner or later. Now go to Stevenson's desk. Use the phone. Accidentally (?) you dial 911 and Nick Costello, security guard, runs in. After a small one way conversation, he leaves. Get on with your business. Use the Voice Mail button and hear that you have six messages. Most important message is the one of dr. Reuben Banks who has been hired to translate some ancient Mongol goatskin with glyphs. Also note that there's a diner, the Legacy Diner, to be held which the U.S. president will attend to. Check the desk drawer, it contains some papers amongst which is a memo from Susanna to Stevenson. She confirms the blood on the sword is human. Again forgot to read it? Well, click here for memo. Now you've paged Susanna, she'll come to Stevenson's room. Leave there and go to the Restoration Room. Susan's just leaving. Enter! When you look around, you can find lots of things. There's a, quite hard to find, scale kind of thing filled with some blue liquid. Open the closet, for example, and find a bottle with Flora Chloric Acid gel and a electric crucible. Get some wooden sticks from the white desk. Get the two empty bottles. At this desk, it's Reg's, there's a small box too, that contains some mysterious riddle about bottles. Read it. Look up at the white desk and read the memo from Macy. It's about three missing artifacts from the Capricorn collection. Turn 180( and find the pink box (this is Susanna's desk), find a letter. It's from Sauvage Gallery telling Susanna her art is not what they wanted it to be. You might run into Reg Westlake. Get his empty whiskey bottle. Now you should free some spirit, my friend. Maybe you remember the riddle about the bottles? You can use it now. This solution, which is a difficult one according to some people, is in my opinion the most easy one. Put the wine bottle (6 ounces) in the foam cup (16 ounces). Pour the water from the whiskey bottle into the wine bottle: 6 ounces in the bottle and the remaining five ounces in the cup. Pour the water from the smallest bottle (2 ounces) in the cup too and you've got 7 ounces of water. Just what the chalice needed! Now pour the water from the cup into the chalice and 'add' the blood. Wow! Some chemistry! Now pour this over the Capricorn head and free Mei. End op episode one, so far, so good! How About The Past Of Laurie Wood? Now we've freed Mei, her magic can help you against their magic. Example? Click on the crystal ball and Mei gives you a picture of a room you need to go to. Macy's over by the candelabra on the wall. He turns it to close the secret passage behind the bookshelves. He also gives some kind of command to someone to lock it. When he's finished his speech and has left, go to his desk. Use his phone, he has three Voice Mail messages. Again the goatskin with the glyphs is mentioned. Also seems that Susanna insists on getting her own exhibition. Go to the bookshelves you saw him close a while ago. Turn the candelabra. Shake the maraca. Then examine the book on the left side of the top shelf. It contains some receipt on how to make a certain chemical. Go from Macy's office to the garden. Here you'll meet Nick Costello. He mumbling and finally screaming. He seems to rehearse some kind of speech. And he's mad at you. Why? He tells you he's sure there's another presence there, he hears voices, there's magic, he feels somebody's watching us... Wow, Fox Mulder, eat your heart out! When he has left, go to the bench he was sitting on and get the newspaper. Solve the puzzle. To change letters, click on one and drag it to it right position. When done right, the words you should get are, Capricorn, Museum, Treasure and Adventure. The solution needs some drag and drop too, to get the solution: Discus. So far for Socrates. In here, you meet Mei again. She gives you the Memory Book but before you can take it, it driven away from you by some evil force that locks it up in the chest. And, of course, that chest is locked! Yep, I know, nothing seems to be working in your advantage. So what your goal now? Opening this chest! Before you leave, search this room. There's a toy like art thing with marbles and a watering- pot. Use the marbles and the camera will tilt. See a plant and take a leaf from it. There also is an objet d'art with balloons. Take a colorful balloon from it. Mei left you a magic camera. Pick it up. The magic camera symbol will be placed left of your screen; button, lens and warning light. When you've take pictures, press the button to look at the Picture Book. Take the new puzzle from the shelves; the Black 660. It has four pieces, of which three can be put together already. A lot of it is missing, but these pieces will be obtained later in the game. Mention the mystic puzzle symbol to the right of the playing interface. Go to this room and pass Jordan Cooper's office on the way. You hear three people arguing. Seems to be Macy, Cooper and Susanna. There's the sound of breaking glass after which everyone starts mumbling. Nothing more to hear, here. Walk on! In here, Reg is trying to open the drawers of Stevenson's desk. He escapes, leaving a screwdriver for you. Take it. Mention that he puts a paperclip in his pocket. As you can't open the drawer with just the screwdriver, you might as well try to get a paperclip yourself. Leave the room. Use the screwdriver in the examiner interface. Then use the large paperclip on the screwdriver. Get screwdriver and use it on the chest. Put things back in your inventory and open the chest. The book appears and it will also be a new item on top of your playing interface. All over the book, scorpions are crawling. Use the piece of mirror. Place the reflection triangle on one of the creatures and it will be killed by one of it's mates. Do this till one scorpion is left. Now close the book to crush the last survivor between the pages. Yuck, bloody mess! As you leave the room, Mei will explain the Memory Book to you. It's been given to you to reconstruct the past and it's tenses. Go to the statue and grab it's crotch. Yeah, sorry... Only to get the fifth piece for the mystic puzzle, I swear, nothing else intended! 1. Poke up the fire with the poke, get the piece of paper that comes out. It tells you about Jordan Cooper for the Memory Book and will be stored in the Scrap Paper Folder. Get the videotape from the counter. Probably will come in handy later on. 1. Nameplate, on the counter. It tells you something about Lorena. Make sure the picture is now in the Memory Book. Meet Lorena again. She's excited about the US President coming to visit the museum. 1. Latex bottle, on the white desk, tells you about Reg. 2. Memo, above the white desk, tells you about Reg. 3. Letter, in the pink box on the white desk, tells you about Susanna. 4. Necklace, in the pink box too, tells you about Susanna. 5. Scalpel, in a box of cutting tools in the back of the room, tells you about Reg. Might be a bit hard to find, but when you walk towards the room, you should find some more working desks. Take the knife with you. 6. Ring, on the big white table in the middle of the room, tells you about Lorena. Small object so look carefully! Take the ring with you. 1. Note, written on a napkin, on the diner table, tells you about Macy. At this point, you'll get the Scrap Paper Folder to put the note in. This room is behind the Snack Room, as can be seen on the map. Enter it. There's a switchboard, which might come in handy later. In the storage racks, you can find a red/black bug spray, a yellow/black glue stick and a piece of pipe. 1. Piece of paper, tells you about Laurie. Take the piece of paper with you in the Scrap Paper Folder. There's no memory item to be found here. So why are we here then? Mention the blinking green light of the mystic camera, this means a psychic photo can be take in this room. Then go to the coffin and place the cursor over it. The cursor will change in a camera icon. Use it and make a picture of the corps. The picture will be placed in the Picture Book. This is Nick Costello's quarters. Get some dart arrows from the wall. Open the closet with Nick's name on it. There's a picture of Susanna in it and one of a little girl... Open the closet to the right of Nick's and find a small medicine bottle with a black microphone in it. Go to the fridge and open it. Find some kind of listening device. Also take a look at the MAKA 5 security system. 1. Magazine, in open chest, tells you about Costello. Get the mirror piece from the desk. Take the powder compact from the desk corner. 1. Brochure of Fealty Investments, on his desk, tells you about Cooper. 2. Book about the Cooper family, on the bookshelves, tells you about Cooper. 3. Piece of mirror, beneath the desk light, tells you about Susanna. 4. Menu of Empress of China restaurant, waste bin near desk, tells you about Susanna. The fourth item mentioned above, is the fourth item telling about Susanna in the Memory Book. Watch the movie clip in which Susanna and Stevenson are arguing. He's mad at her because she's sleeping with Jordan. She's mad at him because it's not his business and because she always loved him but thought he didn't like her. She was wrong. Well, some soap kinda thing. Open the dark brown cabinet with the screwdriver and the middle size paperclip. You'll find, in the upper drawer a newspaper article and a supply re-order list for, amongst other things, flora-chloric acid. Mention the note that it's used to dissolve metals. In the bottom drawer you'll find a letter. 1. Contract, on desk, tells you about Macy. 2. Newspaper article, in cabinet, tells you about Macy. - Oct. 2nd, 1998. To dr. Reuben Banks, $7500 for Mongol translation. - Sept. 29th, 1998. To The Legacy Club $15000 as a donation. 1. Bill, in desk drawer, tells you about Cooper. 2. Letter from Laurie's father, in the waste bin (use phone to reach it), tells you about Laurie. 3. Picture, in desk drawer, tells you something about Lorena. 4. Receiver, in desk drawer, tells you something about Nick Costello. Make sure you take this one with you! There's a orange colored cabinet of which the upper drawers can be opened. One contains a note from some Matt. On the desk is a note from Reg. He's made a copy of some key but glued it accidentally to his desk. Must be the key to the orange cabinet. Meet Susanna again. She's mad at Reg because he didn't play by the rules. When she finally found the scale, she leaves furious. This scale can late be found in the Supply Room! You can now open the orange cabinet by using the key on the lower drawer (no yellow rim around it this time!). Open it and find a box. Open it; it contains some bullets and a letter. Both are memory items. Now you got all four items about Laurie's past; the movie clip appears and tells you about Laurie and Stevenson having an argument. Seems she's started some letter campaign against her father because he would have killed her mother. Stevenson brings out the jewel box with the gun in it, trying to make a deal with Laurie. He wants to help her investigate her mother's death. You can open the desk drawers by using the screwdriver and the small paperclip. The middle drawer contains scissors, lipstick and perfume. The right drawer contains some newspaper article. Didn't we see that one before in the newspaper in the Gift Shop? Anyway, some letters are cut out. Check the phone. There are 2 messages on it. One from Macy, telling her that Susanna has gotten her own exhibition and one from her father who seems a bit desperate to see her. Seems she's avoiding him. Now check the left drawer. It contains a note and a torn up letter. Read the letter, make sure you read 'down'. Laurie comes in and tells you to leave that stuff where it is. After she left, check it again and now it'll be a memory item to Nick Costello.. The movie clip shows you Stevenson and Costello telling him not wanting to spy on people anymore. Stevenson insist on doing so, as he suspects something illegal going on in the museum, some kind of conspiracy. Nick leaves confused. 1. Bullets in box, orange cabinet, tells you about Laurie Wood. 2. Letter in box, orange cabinet, tells you about Laurie Wood. 3. Torn up letter, left desk drawer, tells you about Nick Costello. Go to the hall and meet Nick. He tells you Macy wants to see you. Go see what Macy wants. Macy will give you some good advice. Then he'll help you out with a little job. Make him a cup of tea with sugar. Get his teacup and leave the room. So far, you have encountered a lot of items which had no use so far. This is the time and place to use them. Go to the desk and read the 'Machine Impossible' magazine. On the last page you'll find a list of required items to build a machine called "The Englishman's Friend". Unfortunately the picture is missing. So here's where creativity starts. Before building the machine you have to do two things; first, use the wooden sticks (toothpicks) in the examiner and use the glue on them. Second, get a teabag from the bowl on the left side of the teapot. Go to the table with the teapot on it. Around this you have to build the machine. Have a look at the screenshot and the following list of items. 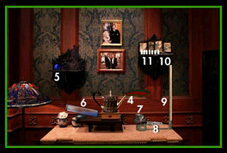 Place the items there where the corresponding numbers in the picture point them out. By the way, items 1 to 3 are already there. Finally, place the teabag in the cup. Then turn the machine on by clicking the red button beneath the teapot. A cup of tea will be made in an not so ordinary way! Note: When somewhere things went wrong, put al the items back in their original position and start over again. Go back to Macy and hand over his cup of tea. He likes it, puts the cup back on his desk and leaves the room. Go to the cup, get it and examine it. Inside is another piece of the mystic puzzle. Get it and complete the puzzle a little more. Meet Susanna. She's having trouble with the tape recorder. No batteries! But Nick has, if you remember him re-filling his flashlight at the beginning of this episode. When you return, Reg is on the phone with some Brenda (love). He tells her Stevenson is not longer a problem. They also talk about someone blackmailing Reg. He warns you this conversation never took place. 1. A phone conversation between Stevenson and Susanna - about a past relationship? 2. A phone conversation between Stevenson and Reuben Banks about the translation of the glyphs on the goatskin - Stevenson says he's hidden the skin in the Restoration Studio... somewhere. 3. Laurie talking to someone - recorded by a placed bug? 4. Agent Kiefer from Secret Service calling Stevenson about The Legacy Club diner. Go here to take another picture with Mei's camera. This one must be of the Capricorn head itself. Enter the hall through the door next to Stevenson's office. Nick again. He's reading some comic book which is a distraction from the voices inside his head. He wants someone to help him. He knows you have help from a 'Chinese babe' - must be Mei - and he's sure she can help him too. So you need him; he helps you, you tell Mei to help him. Meet Nick. He tells you 'cold iron defeats magic'. Another voice in his head? Walk to the window and then to the working benches. Susanna is looking at one of her paintings. She's furious as there a piece somehow removed from it. She leaves. Take a look at the painting. In the garden, on the bench, you'll find the brush Susanna was pointing at you. Take a 180 turn and examine the wall in front of you. There's a gray brick in the center. Throw two dart arrows at it by placing their tips on the upper right and lower right corner of this brick. A secret hiding place opens and you'll find a picture of a man and a boy (Jordan Cooper). Go to Susanna's desk (the one with the pink box on it) and use the fragment of the Horned Helmet in the mortar. Grinded horn will come out. Now go to the back of the room again, to Susanna's painting. Use the grinded horn on the white paint bowl next to the bottle. Magic paint is now ready for use. Use the brush you found in the garden with the magic paint and start coloring the painting in the painting. To be more specific; on Susanna's painting there a painting painted (still with me? ), which is the square with a missing puzzle piece. You must paint this whole square with the magic paint. Do this by clicking your mouse button and moving the brush around. When you're done, a movie clip will start. If it's not starting, keep on painting cause you might have forgotten a micro sized pixel. When the movie clip of the Capricorn head starts, you're done painting! Mei will tell you that you know her now and that'll be the end of chapter 4. Mei will talk to you. Just follow her into the hall and then into the Security Room. Turn towards the MAKA 5 system and she'll explain things t come. 1. View New Artist Gallery. Reset the system; Nick wants to override the system. 2. Unlock the New Artist Gallery to let Nick out. 3. Unlock Macy's office. Macy can go out now. 4. Unlock the Snack Room (or Break Room). Macy will come in but forgot the key. 5. Unlock Snack Room to let Macy out again. 6. Unlock Macy's office. Nick comes in and takes the key. 7. Unlock Macy's office to let Nick out. 8. Unlock Snack Room. Nick comes in and unlocks the door to the Supply Room. 9. Unlock Snack Room to let Nick out. 10. Unlock Snack Room to let Macy in. He will try to unlock the power box. 11. Unlock Snack Room to let Macy out. 12. Unlock the Restoration Studio. Macy comes in and takes a screwdriver. 13. Unlock Restoration Studio to let Macy out. 14. Unlock Snack Room. Macy will come in and open the power box. 15. Unlock Snack Room to let Macy out. 16. Unlock Great Hall. Lorena will come out. 17. Unlock the Snack Room to let Nick in. He tries to jump the wire. 18. Unlock the Snack Room to let Nick out. 19. Unlock the Snack Room to let Lorena in. Tries to jump the wire too. 20. Unlock New Artist Gallery to let Lorena in. Tries to get a wire. 21. Unlock New Artist Gallery to let Lorena out. 22. Unlock Cooper's room to release Cooper. 23. Unlock Cooper's room to release Susanna. 24. Unlock Laurie's office to let Laurie in and clean a gun. 25. Unlock the Restoration Studio to let Susanna in. 26. Unlock Laurie' office to let Laurie out. 27. Unlock the Capricorn Room to let Laurie in. She gives the gun to Reg. 28. Unlock the Capricorn Room to let Laurie out. 29. Unlock Laurie's office to let Cooper in. He gets the steps for Lorena. 30. Unlock Laurie's office to let Cooper out. 31. Unlock New Artist Gallery to let Cooper in. He puts the steps there. 32. Unlock New Artist Gallery to let Cooper out. 33. Unlock New Artist Gallery to let Lorena in. 34. Unlock New Artist Gallery to let Lorena out. 35. Unlock Snack Room to let Lorena in. She uses the wire. 36. Unlock Snack Room to let Lorena out. 37. Unlock Snack Room to let Laurie in. She fixes the patch. 38. Unlock Snack Room to let Laurie out. 39. Unlock Snack Room to let Nick in. He fixes the power. Memory book: 1. Audio cassette. Tells you about Macy. 2. Saddlebags/ dagger/ bracelet; the missing artifacts. Tells you about Reg. 3. Note. Tells you about Lorena. 4. Blueprints. Tells you about Cooper. Don't forget to take the Mongol dagger from the saddlebags. It looks just like your down pointing cursor, so don't get confused! The blueprints are on the pedestal at the other end of the room. These will trigger the movie clip about Cooper. He has been using money to build stuff for his own good. His father was disinherited and so was he. Stevenson is not happy with it and sends him out. Finally, take a magic picture from the far corner of the room; it's one of Nick's corps... Then leave and overhear a conversation between Lorena and Macy. Doesn't sound pretty! End of chapter 5. How About The Past Of Nick Costello? Sit behind Nick's desk and get the puzzle piece. Finish the magic puzzle. A comic book will appear which you must read. The title is 'Certain destiny' and it's about Nick's life. Just watch the story and make choices at the end of one or two pages how to continue. Choosing is done by moving the green question marks over the page and click. Either choice will have the same ending, only storyline will differ a little. If you like the comic book idea, try at least the boy and girl story line (first choice). When the comic book has ended you have to solve another two puzzles. Do so and the comic book will disappear. Use the audio cassette you found in Macy's secret room in the ghettoblaster. Macy is trying to make a speech for the upcoming Legacy diner. Doesn't seem to friendly, though. Go to the secret room and meet young Nick again. When he's shot, get his keys and the second bug. This is the only one that works! Place this one in your inventory carefully so you remember which one is the good one. Make sure you get these items before you turn around. Nick has a majestic revelation for you; you're Stevenson. And the magic took away your memory and your voice... This evil Wah-Jin will also influence world leaders like the US president... by using the Capricorn head's magic! You have to stop the ritual! Turn around and meet Mei. And that's the end of episode six. The safe code will change every time. So an absolute solution can't be given. Try this method to get the combination. 1. The safe has three sounds: a bleeping sound (standard sound), a click or click (right number sound) and a buzzing sound (standard sound). Obviously the clicks are important. 2. First thing to do is figure out which numbers are in the combination. Start giving the combination 111111, 222222 and so on to 000000. When you've entered the last number, you'll the bleeps and the buzzer. Listen carefully how many clicks you hear in between. One click means that this number is one of the numbers in the combination, two clicks means this number will appear two times in the combo. 3. Finally you will have heard six clicks. Now you know what numbers are in the combo. Now you need to know in which order they should be placed. 4. The best method is this. Enter one of the six numbers you found at the first place and fill up the combo with numbers that are not in the combo. For example, if the numbers in the combo are 123456 then enter a 1 first and fill it up with 9's. The function of the clicks has now changed from 'right number' to 'right position'. If you hear a click, this number is at it's right position. If not, try again with another number. This way, at the most, you have to try 6 times for the first position. Keep doing this for the other positions too. At the end, you should hear six clicks and you can open the safe with the handle. Find the videotape. Make a magic picture of the Capricorn head. As this is the last one, a movie clip will be started, showing Lorena and Stevenson in this room. Lorena will explain the experiment to you and you just see yourself dead in the coffin (if you didn't recognize yourself earlier in the game). See how the goathead is a secret lock. Click on the goathead to unlock the door behind the blue tapestry. Then go to the tapestry, move it and open the door with the Mongol dagger. Downstairs, look right and find Stevenson's body. Read the letter from Reuben Banks on his body and memorize the recipe. Move around and walk to the alcove. The guardian statue will appear. Go upstairs and back to the Capricorn Room. Inside, move right and use the ceremonial incense burner. Put the hair, the perfume, the leaf and the match in it. The magic will make the guardian statue disappear. Go downstairs again and the guardian statue will disappear. Go to the door and walk on by using the poke on the red clouds. Inside, the whole staff is gathered for some experiment. Lorena starts the magic which consumes all bodies and souls. Except yours... When Lorena has turned into the evil Xiao, turn around and get the two amulet pieces and put them together on the door. Get the amulet and put it in your examiner. Then use the chalice on it to make it one amulet again and turn around to beat Xiao. When she points at you, click the amulet on her and she'll be destroyed and Wah-Jin with her... for ever more. Mei will tell you the trial is over and a little numb you leave the museum. There you meet agent Kiefer from secret Service. He asks you if there's something wrong. You look at him and stumble: "No, not anymore..."
Questions, suggestions, remarks or additional information? Just want to let me knwo what you think of this walkthrough? Let me know! Mail me!